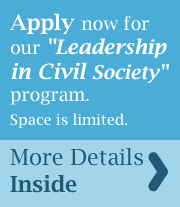 The New Libya Foundation is now accepting interns for the summer of 2015. Internships are a great way to discover Libya and experience the various components of the role of civil society in democratic transitions. We also work to ensure our interns serve our mission while doing what they are good at and what they enjoy so that they may get the full benefit of an international internship. Please message internship coordinator Manal Mansur at Mansurmanal@gmail.com, and cc Rihab@newlibyafoundation.org for more information on intern qualifications, duties and benefits.